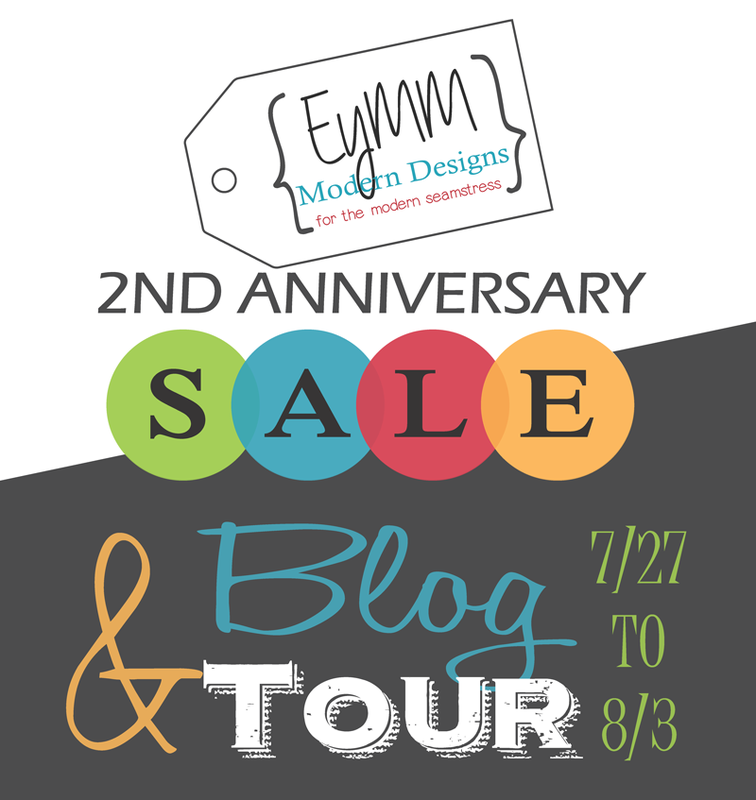 Welcome to Sewing The Seasons, thanks for popping by to visit during the EYMM (Everything Your Mama Made & More) 2nd Anniversary Blog Tour. 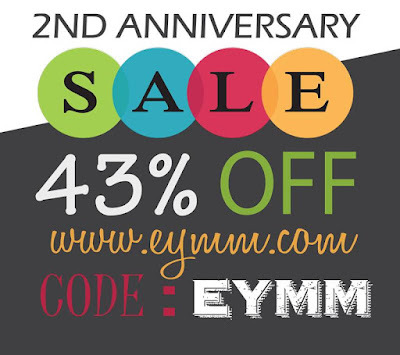 Join EYMM and 24 fellow bloggers as we celebrate the first 24 months of our pattern shop with a huge sale and giveaway! We will be featuring 8 different patterns for women and girls, as well as having a Manic Monday sale and a huge site-wide sale. There is also a great giveaway at the bottom of this post. Don't wait because you don't see sales like this often from EYMM and it will be over before you know it! *NOTE* The links below won't show the tour posts until 11am PST on their day of the tour, BUT you are welcome to click through and check their blogs out at any time. Not only is there an AMAZING blog tour going on but 1 lucky winner that leaves a comment below between now and 8.3.15 (3rd August) will win a FREE EYMM pattern of their choice!!!! Which one would you pick? Then hop on over to EYMM to check out the awesome SALE, and an even bigger celebration giveaway with over $1000 in prizes. 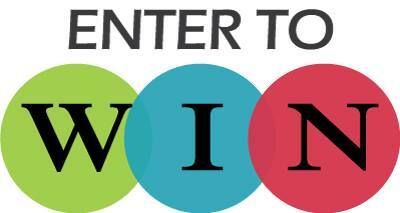 There will be 40 winners in all. I have recently discovered the EYMM patterns and love the fact that not only are they well designed with clear directions, but also that they come with such a broad size range from XS - 5X. For the Anniversary Tour, I made the Women's Four Seasons Cardigan and Duster Coat pattern. It's such a versatile pattern with several sleeve length options as well as the option to include a hood. Mine is the Cardigan option, long sleeves without a hood. This is going to be one of those grab and go pieces in my wardrobe, to pull on over a tank or tee. I love how the front drapes as it hangs (it was a windy day taking these photos) and it will be no surprise to those who know me that I used a bright pink for my Cardigan. 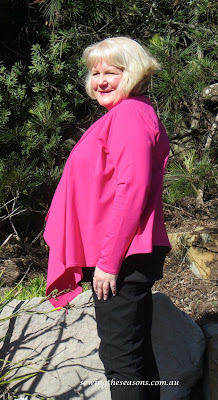 Love the pop of colour it gives worn with black basics. This is such a quick sew and being from knit so easy to put together. My fabric is a combed cotton jersey 92% cotton, 8% lycra mix (weight 220gsm) but I can see making a summer, short sleeved version out of a finer knit as well. Sewing the EYMM patterns has reignited my love and confidence in knit sewing. There are extra steps and links to tips in the patterns for those not as familiar with knit sewing and there are some great patterns to try - not just ladies but for kids as well. As with all EYMM patterns, the sizing chart is very clear giving added measurements such as across the shoulders for this one. There is also accurate advice on each pattern about what to do if you fall between two sizes and let me say you can trust it!! When I first chose this pattern, I wasn't sure whether I wanted to make the longer Duster Coat version or the Cardigan. 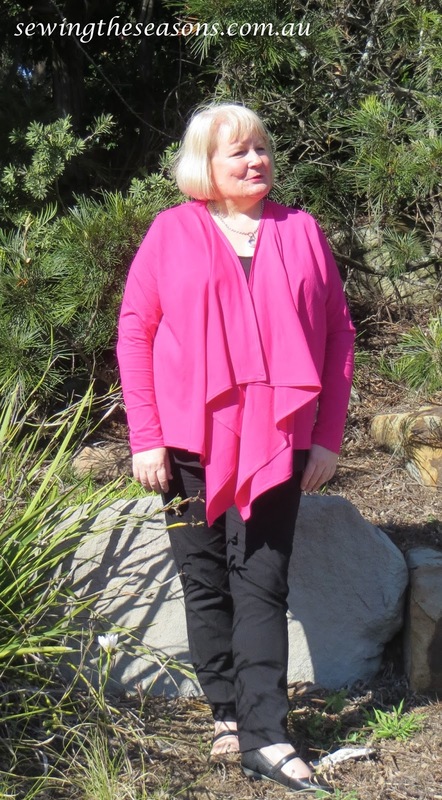 I did actually start out making the Duster Coat as you can see below but happily re cut it out to make the Cardigan which for me will be far more versatile. being part of the skirt testing process. The Duster Coat would work really well as a bright winter coat, but I decided I really wanted the Cardigan so unpicked the sleeves and cut the duster down to become the size 1X Cardigan. Wanted to share this with you as it shows how well sized the EYMM patterns are- trust them! and also how you can resew something to get an even more functional piece that suits your wardrobe. Why not pop over and check out the other bloggers joining in the tour (links above) - they have reviewed some different EYMM patterns as well. Oh, and just for an added extra, I have been whipping up more of the Capsule Skirts since the pattern test, this pattern is now my go to skirt pattern and here are my latest skirts, there will be more! Both skirts are made with Lillestoff fabrics (95% cotton, 5% lycra mix). For Australian readers, I sourced all of these knit fabrics from Zebra Fabrics. I just love your 4 season cardigan especially the bright pink color! I love color so could so see me wearing this! I have to say i like the longer version too! Your capsule skirts are great too! I am having a hard time deciding which pattern I'd pick as I like so many including these too! I may have to buy more than one! Thanks for these lovely comments Ramona, I agree about having a hard time deciding on a pattern, I can't decide which one to try next myself! Thanks for stopping by. I would love to make a 4 seasons cardigan as well. Love how versatile they are! Love the color of the one you made. Thanks Debby, pop back with a piccie if you make a cardigan, would love to see. thanks for stopping by and visiting. Can;t wait to see what you make Bobbie, thanks for stopping by. Ooh, I definitely want to make a cardigan too!! I love your version!! And it was helpful to hear about the sizing, and see both pieces on you. Thanks! Need to get my hands on this cardigan pattern! Love the colour on you. Thanks for stopping by, you'll love this pattern! Cute cardigan!!!! Love the shade of pink as well! Thanks for stopping by and the encouragement, it's a great pink isn't it. 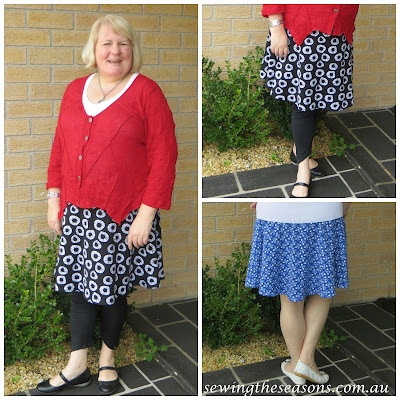 That cardi looks great and so do the capsule skirts you've sewn up. Great for co-ordinating and mix & matching to make different outfits. Love your pink cardi. It looks great. I think I would chose the women's capsule skirt. Thanks for stopping by Claire the capsule skirt is so versatile, love to see pictures if you make one. I agree, the cardigan length is probably a lot more versatile. Looks good. I love this cardigan every time I see it sewn. I am also loving the color you chose for yours, although I can't imagine the tedious task of picking seams out of knit fabric lol. Thanks Kisha, it looks great in lots of different fabrics, yes the unpicking wasn't fun but glad I did it. Thanks for stopping by to visit. This is my favorite pattern! Looks beautiful. Thanks for the compliment Mary, and for stopping by to visit. Your cardigan turned out beautiful. I may need a duster for myself! Thanks Sarah, you'll love it = would love to see photos if you make one. Thanks for stopping by. Thanks Carla, it's my all time favourite shade of pink! thanks for stopping by and visiting. thank you for your advice about EYMM sizes! I often fall inbetween sizes, too, and always wonder about sizing up or down. The cardi is very nice! Robyn, you've convinced me that this is a pattern I need to try for ME! I do prefer the shorter version and the hot pink is just so pretty! 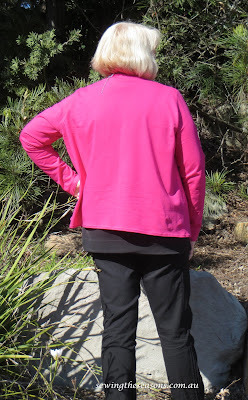 I appreciate your sizing advice as I haggle over that too with so many patterns. my pleasure Kathy, glad to help and inspire, thanks for stopping by to visit. Your cardigan is so cute and you are rocking it!!!! I would love Kymys Dolman! Beautiful cardigan and skirts! I am hoping to try the Harem pants next.